One cowl finished and wet. Because it's still quite wet, it shows darker than it really is. It's Bendigo Luxury 4 ply, called 'bracken" and more olive green than shows here. It's a present for DIL, along with some earrings bought at the National Library shop in Canberra. Her birthday is not till March 7, so it's plenty of time in advance. I need to remember to buy paper for this. I used to have a stock but it's sadly depleted. And I need to remember the paper in good time too, not be running around on the day of giving her the gift, still looking for paper. I quite like this, but if I did another, I think I'd make it all in the lower pattern which I prefer to to the top lace. I had several goes getting this right. I started in a different colour, then remembered I have given her something in that colour. Made a mistake on another attempt a few rows in and ripped it out. Decided it would fit around the neck of Elijah the elephant on 4 mm needles so ripped that out too. Finally settled on the green and used 3.5 mm needles. So I had a few gripes. The pattern is very pretty but if I had not seen it in a light blue gray on another blog, I would not have been attracted by the main photo on the pattern as detail could not be seen. the pattern cost US$6 and I would prefer to pay that for pretty well any of Evelyn Clark's pretty designs, with well written patterns. To begin with, no fewer than twelve yarns are mentioned on the pattern. I could have looked them up on something like Yarndex but the variety threw me off. Some were called DK, some called sport, some called 4 ply. To me those names show a significant difference in weight. 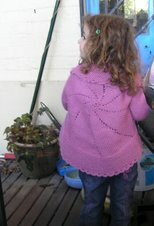 In the end, I took a punt and decided on the 4 ply Bendigo Luxury which I had. I always read through a pattern before I start. I've had a few nasty surprises by not doing this. I found several references to a "hem." Eventually I decided to do what I first did when knitting socks and that was to follow regardless. Surprisingly "hem" refers to the lower pattern. I've never seen that use before and I've done a lot of both sewing and knitting. Even in knitting it refers to a folded edge, caught down one way or another. So this entire lower lace is a hem. Why not call it something like "lower edge pattern"? The chart for this first pattern is on last page of four pages. Looking at the layout, it seems it would fit on same page as the written instructions. The instructions are not the same. Chart instruction for Row 10 where marker has to be moved says, "slip one stitch left without unknitting." Legend for chart says for same row, "remove marker, unknit last stitch and move." ??? So, it's pretty and another piece of lacy summer knitting. It's a gift I think she'll like and will wear, certainly her colour. I've had much better value with patterns from at least three other designers recently. However I wasn't really happy with paying US$6 for a fairly sloppy pattern write up. If you really want the link, it's in the post below this. 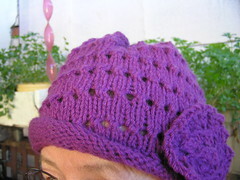 It turned out well, and I agree about the pictures, I couldn't see it at all in the variegated wool. I would expect a hem in knitting to be turned under too. It is a poor show. I have ten sheets of Labrador paper, so I can use that for Everything!!!! It's very pretty - I particularly like the "hem" pattern. So far, I have not bought any patterns on Ravelry; mind you, at the moment I am knitting pilchers and burp cloths so the free patterns are quite adequate (although a pattern for pilchers that go over cloth nappies would be good)!